If you need your car to be bulletproof, bombproof, sniper-resistant and generally able to survive anything this side of a nuclear explosion you’ve probably got quite a lot on your mind. That’s why Land Rover has taken some of the hassle out of foiling would-be assassins with an off-the-peg armoured Range Rover called the Sentinel. 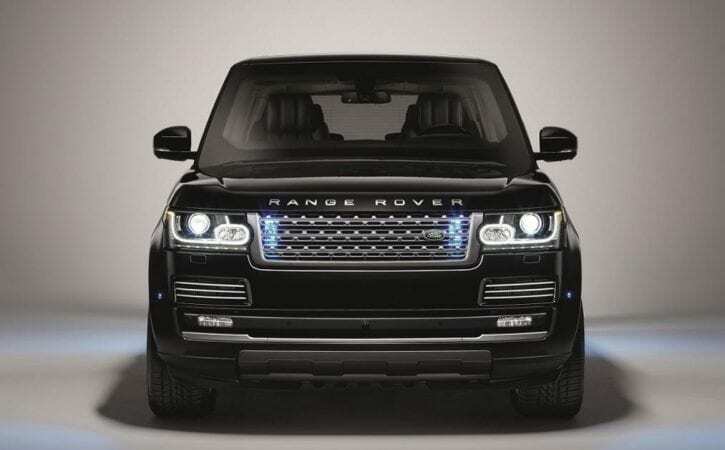 Land Rover handed a Range Rover model over to its ‘Special Vehicle Operations’ (SVO) department and they’ve come up with the Range Rover Sentinel, a luxury fortress with the ability to shake off near enough anything potential attackers can throw at it. The Range Rover Sentinel starts life as a lavishly equipped Autobiography model, and adds a six-piece armoured passengercell made of high-strength steel to protect against attack. The windows are replaced by multi-laminated bulletproof units, while armoured panels deliver protection against grenades and armour-piercing bullets. The Sentinel has an anti-tamper exhaust and self-sealing fuel tank to prevent sabotage, and run-flat inserts in case the tyres are shot out. If the main doors are blocked, it’s possible to escape through a special Emergency Escape System behind the rear seats and for a price, SVO will add nearly any bespoke feature you can think of – from sirens to a champagne cooler. It’s impressive then that from the outside this could be any normal Range Rover. SVO say that the abilities of the car are uncompromised – so the Sentinel’s off road abilities should match those of the standard car. It comes with the 3.0-litre V6 supercharged petrol engine we’ve seen in the F-Type, and the ZF 8-speed automatic gearbox, but with so much extra weight it’s unlikely to be as spritely as the standard car. Knowing this, Land Rover offers a driver training program to purchasers to make sure that the chauffeur can handle the vehicle in an emergency situation. With a guide price north of £290,000, and scope to add a huge array of options, we won’t be seeing too many of these on the school run, but it’s certainly a more discreet option than many of the other armoured vehicles currently available. With that being said, Audi and Mercedes offer special armoured versions of the A8 and S-Class limousines, so this Range Rover Sentinel has a tough job to become the first choice for a discerning monarch, captain of industry or organised crime boss.